My dad's quilt is complete, which also means I finished my first (and largest) holiday gift and it's not even Thanksgiving yet. Not too shabby. 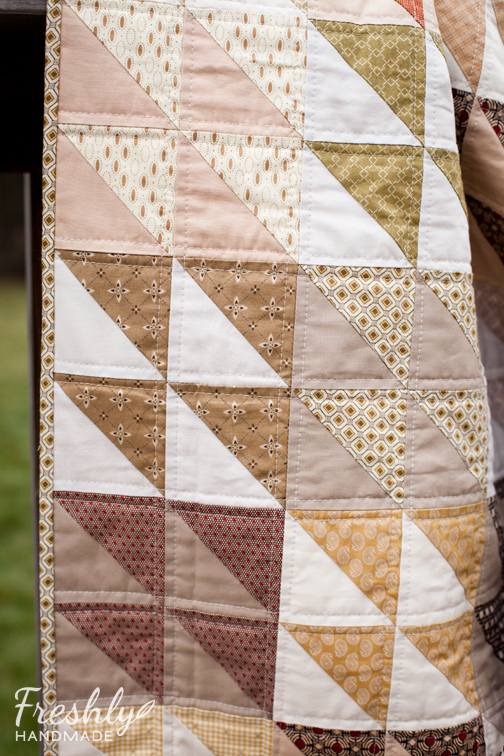 You can read my previous posts on this quilt here and here. I am really happy with the results, but will admit that I was slightly skeptical when I was arranging the blocks. As I was putting them together, it dawned on me that the color scheme may bring my dad back to the 70's when I was born. I mean, I used the terms rust, olive and mustard to describe some of the colors, but they could arguably be called burnt orange, avocado and goldenrod. I'm having a shag carpet flashback into my childhood bedroom. With all the additional neutrals, however, it didn't take long for me to get past it--and love it! I ended up increasing the length to accommodate my dad's height so now the quilt measures 60" x 78" -- a great size for his afternoon snoozes on the couch. 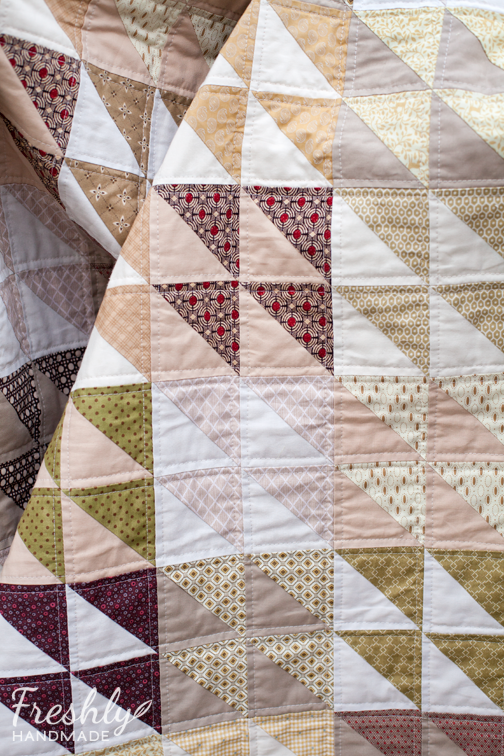 The quilt is made up of 520 half square triangles that finish at 3" each. I quilted it with a straight stitch 1/4" from each vertical and horizontal seam. Due to my last minute decision to increase the length, I needed to add a scrappy border to the bottom with some of the leftover prints. 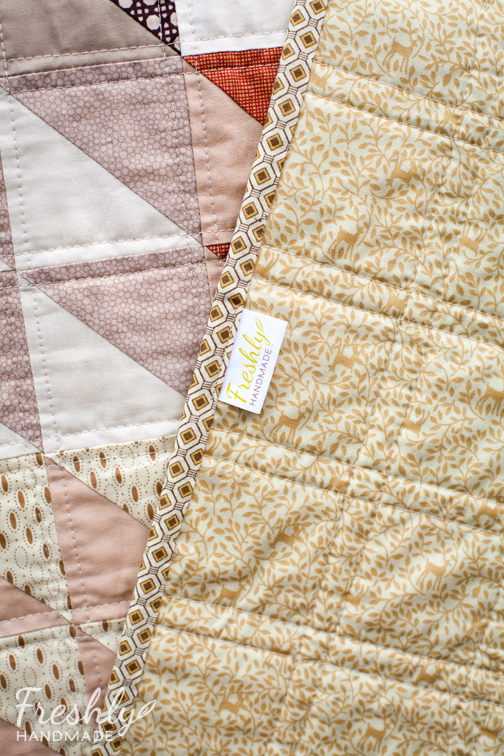 The main backing fabric of woodland deer is a subtle, personal touch for my dad who is a hunter and nature-lover. I'm crossing my fingers that he likes it. It's wonderful! I'm SURE he'll love it. And it doesn't remind me of 70's shag carpet at all. (I'm a child of the 70's too, so trust me on that!) 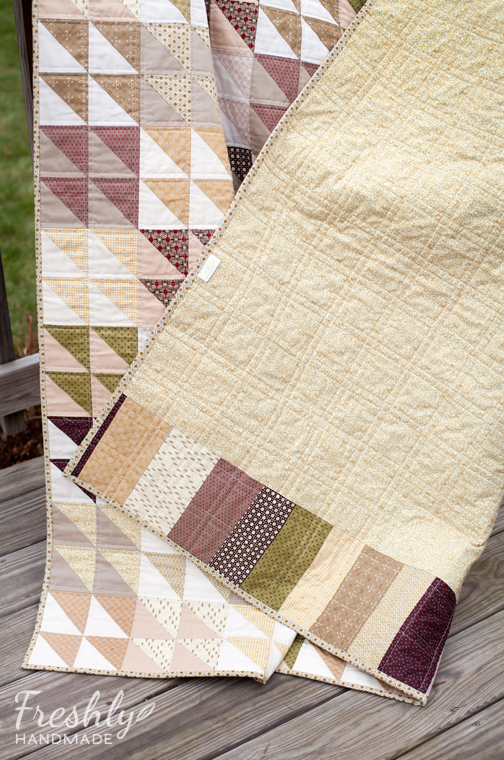 The prints make it very modern- I think it's the perfect Dad Quilt! Those men are tall aren't they?! Love the backing especially! Is that an AMH print? What a great quilt - I'm sure your dad will love it!! I bet he not only likes it, but LOVES it! 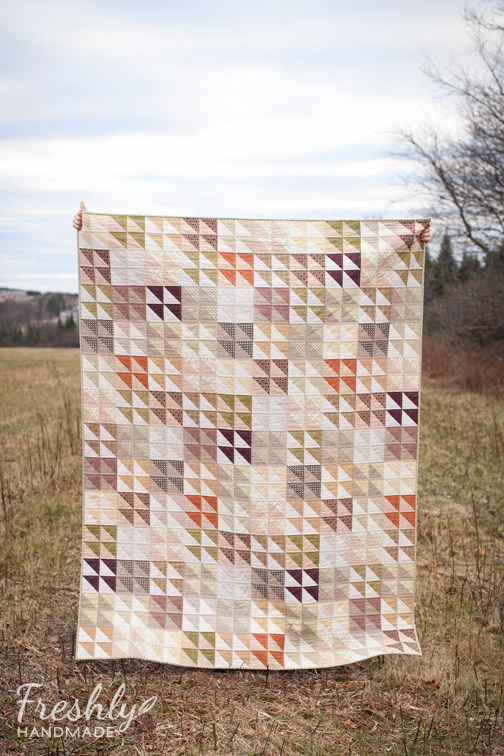 It is a great quilt. That is absolutely lovely - the colours are gorgeous! Well done!